Here is a perfect example of what happens when the sculptor hits a place in the crystalline structure of a stone that fractures off a piece and so badly mars the design that there is no choice but to discontinue. Having been discarded in the garden, this interesting face was found and brought inside to preserve it until it was appreciated for what it illustrated. The process of carving can be seen here and so it is instructive. Using the natural wave-worn surface of the stone where it suggested hair, Allen has left that outer shell undisturbed as he undercut it at the top of the forehead to delineate the hair from the face. He chiseled away the front and sides to reveal the basic square shape of the face with the hollows of the cheeks under high cheekbones, a softly rounded chin and full lips. He then began to cut deeper into the sockets of the eyes. He had begun to work on the eye on the left and to add shape to the nose when the stone fractured across the bridge of the nose. Other sculptors who love direct carving say the same thing. In this case, the stone had to say stop; too much had broken. 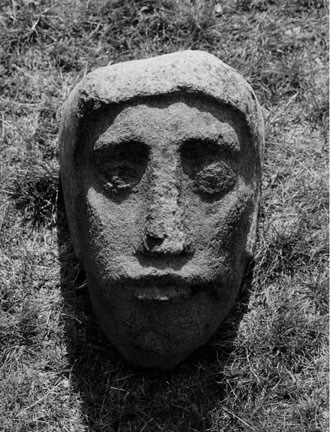 The inspiration for the face may well have been Gauguin. The soft fullness at the mouth and the wide nostrils suggest his Tahitian woman carved in wood at the Museé D’Orsay.